Can I attach a pdf in the autoresponder? Can I attach a pdf in the autoresponder? Not a link to one but actually attach the file. 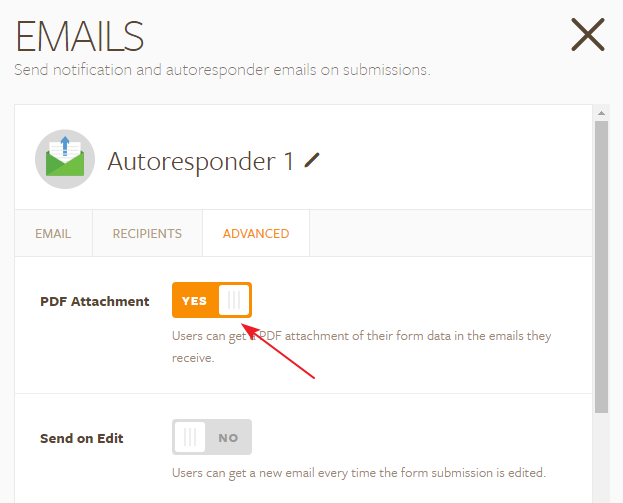 If you are referring to the PDF file with the submission data, it is possible by enabling the option "Attach PDF" from the Advanced section of Autoresponder. them to fill out the form before they can get the pdf. Make sense? Unfortunately, it is not possible to send any attachments along with the email notifications or autoresponders. This is due to prevent abusive users from hogging up our server's bandwidth and resources. At the moment, it is only possible to send a link with the emails. Hi, curious if I can get rid of the "charge customer now" and "stripe customer ID" code from the form the client receives. I have allowed auto-responder to attach a PDF form for client's copy but would not prefer the client to have the option to process the charge or see any stripe code on their end. Is there a way to remove those two lines from the form?